Dentures allow patients who have lost a significant number of teeth to restore the strength, function, and beauty of their smile. Unfortunately, many people do not feel comfortable with traditional dentures because they don’t always fit securely, and have a tendency to shift when a patient is eating, chewing, or speaking. Patients looking for a more secure alternative to traditional dentures should consider implant-supported dentures. Implant-supported dentures are anchored by a series of dental implants, which are titanium screws that are surgically implanted into the jaw, where they fuse with the patient’s natural bone. Dental implants act as artificial tooth roots to provide the ultimate level of comfort, security, and durability for patients in need of tooth loss treatment. Because of the many benefits of implant-supported dentures, Windsor, CA, dentist Patrick Seely recommends these restorations for those patients who have lost a large number of teeth. Traditional dentures have come a long way in recent years, but many patients still feel like these restorations are not secure in the mouth. Traditional dentures rest on top of a patient’s gum line and are held in place with special adhesives. Unfortunately, with little support, it is possible for dentures to shift or even fall out of place when a patient is eating, drinking, or speaking. Implant-supported dentures offer far more security. 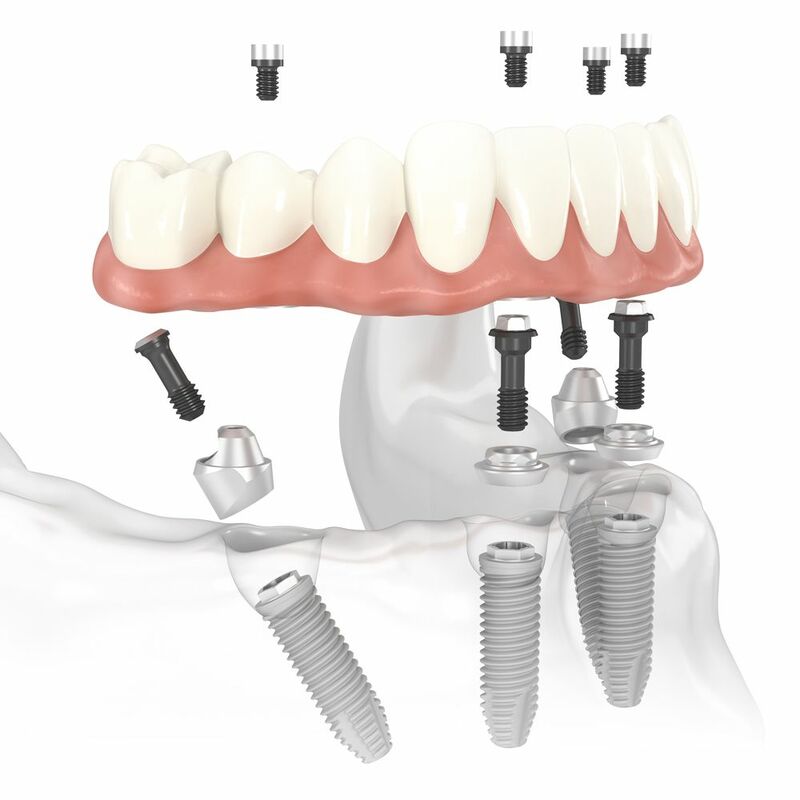 Implant-supported dentures are attached to metal abutments that connect to a series of dental implants, which have fused with the patient’s jawbone. Thanks to the support of dental implants, implant-supported dentures truly feel like the patient’s natural teeth. A person can eat any foods they want without fearing that their dentures will move or fall out. Bone degeneration is one of the most common complications following tooth loss. A tooth’s roots absorb the shock each time a patient bites or chews. This shock then sends a signal to the jawbone that stimulates the continual growth of healthy bone tissues. When a tooth is lost, the jawbone no longer receives that stimulation and, over time, the bone will degenerate. Eventually, the entire structure of the face and mouth can be compromised. Traditional dentures fail to address this problem. However, implant-supported dentures preserve the jawbone by providing the stimulation that was once provided by the tooth’s roots. A dental implant is, essentially, an artificial tooth root. It not only supports a full range of dental restorations, including dentures, but also encourages the growth of bone tissues. Another common complaint about traditional dentures is that they can be difficult to care for. Dentures need to be removed each night so that they can be cleaned and soaked. On top of that, getting dentures to stay put can be kind of a hassle, and requires the use of messy dental adhesives. Fortunately, implant-supported dentures do not require any special care. Since they stay in the mouth and are supported by a series of dental implants, they can be cared for just like the natural teeth. Patients can brush their teeth each night and don’t ever have to worry about removing their dentures or getting them to stay in place. Implant-supported dentures are fabricated using the highest quality materials, so they are meant to last. Once dental implants have fused with the jawbone, they become a permanent part of the mouth. As long as a patient maintains good oral health, they should never have to replace dental implants. Even if a patient’s dentures were to become damaged, we could simply replace the restoration and secure a new set of dentures to the implants that are already in place. If you are in need of dentures treatment, we highly recommend that you consider the benefits of implant-supported dentures. To learn more about dental implant treatment and whether implant-supported dentures are right for you, contact us at your earliest convenience. Dr. Patrick Seely looks forward to meeting you!